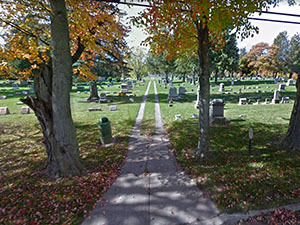 Pleasant Hill Cemetery is managed by Bath Charter Township. It is located on Webster Road just north of the Bath Township Hall. The oldest sections are 3 and 4 followed by 2, 1, 5, 6, 7 and 8. Sections 1-5, 7 were read in late May and early June 2007. The remaining sections were read in August 2007. BACHELDER, Martha, d. 5/19/1887, a. 22-0-13, Section-Lot 4-4, Dau of S & M.C. BACHELDER, Mary C., d. 6/16/1887, a. 60-1-6, Section-Lot 4-4, Wife of S.
BELL, Edie, d. 7/30/1887, a. 1-9-2, Section-Lot 3-3, Dau. Of G.P. & A. R.
BRITTEN, John R., 1887-1972, Section-Lot 1-10, Aka J.B.
CARPENTER, Luella, 1881-1950, Section-Lot 2-10, Rev. CHAPMAN, Effie J., d. 12/11/1882, a. 18-1-0, Section-Lot 3-8, Dau. of I & P.E. CHAPMAN, Evelyn, 1/2/1894, Section-Lot 3-5, Dau. of C.J. & C.E. CHENEY, Sarah A., d. 6/21/1877, a. 12y, Section-Lot 3-15, Dau. of S.D. & S.A.
COOK, Clarence J., 2/12/1893-8/25/1901, Section-Lot 3-11, Son of W.H. & H.
COOK, Hermoine, 2/29/1871-9/11/1901, Section-Lot 3-11, Wife of Wm. H.
CRONKITE, Almira, d. 5/15/1877, a. 22-2-15, Section-Lot 3-15, Dau of J & S.A.
CRONKITE, Grant H., 3/1/1876-3/4/1876, Section-Lot 3-16, Son of C.M. & L.A.
CULVER, Caroline M., 1849-1931, Section-Lot 2-5, Wife of J.L. DAVIS, Ella M., 1853-1936, Section-Lot 2-8, Wife of James C.
DEBAR, Minnie M., d. 4/28/1887, a. 0-11-27, Section-Lot 4-9, Dau of J.D. & E.
DEBAR, , d. 6/4/1870, Section-Lot 4-15, Son of N.J. & E.J. DRYER, Gerry, d. 2/2/1867, Section-Lot 4-13, Son of N.A. & C.E. GUTZKI, Joanne D., 2/24/1939-, Section-Lot 7-5, Parents of Charles A Jr., Christopher E., Joel L., Lisa L.
HALL, Clara, 1849-1896, Section-Lot 4-14, Wife of W.S. HALL, Polly, 1823-1904, Section-Lot 4-5, Wife of H.
HAVILAND, Rebekiah M., d. 12/18/1877, a. 67-5-11, Section-Lot 4-10, Wife of J.B.
HAVILAND, , d. 3/10/1875, a. 10d, Section-Lot 4-7, Ch of A.G. & G.M. HAVILAND, , d. 3/15/1875, a. 15d, Section-Lot 4-7, Ch of A.G. & G.M. HAVILAND, , d. 11/26/1871, Section-Lot 4-7, Ch of A.G. & G.M. HERBISON, Charlie, d. 2/17/1878, a. 3-10-2, Section-Lot 3-8, Dau. of J.H. & C.E. HERBISON, David H., d. 7/2/1881, a. 4-6-3, Section-Lot 3-8, Son of J.H. & C.E. HERBISON, Nelly E., d. 12/17/1870, a. 0-3-12, Section-Lot 3-8, Dau. of J.H. & C.E. 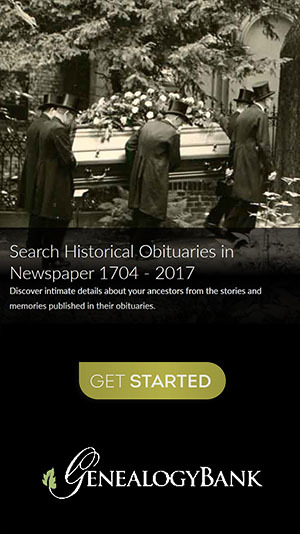 HYLER, Bertha, d. 2/26/1890, a. 15-8-4, Section-Lot 4-5, Dau. of A.
HYLER, George, d. 10/4/1882, a. 20-2-4, Section-Lot 4-5, Son of A.
HYLER, Nellie, d. 10/11/1879, a. 6w 1d, Section-Lot 4-6, Broken marker; Dau of I.R. & R.A.
JUNE, Alberta Neilson, 1866-1912, Section-Lot 2-2, Wife of Phineas F.
KNAPP, Don, Section-Lot 3-4, Infant of G.B. & H.E. KNAPP, Erwin C., d. 2/25/1879, a. 9-1-8, Section-Lot 3-14, Son of L.W. & A.V. KNAPP, Etha, Section-Lot 3-4, Infant of G.B. & H.E. KNAPP, Mauoa, d. 7/23/1879, a. 2-2-0, Section-Lot 3-16, Dau. of L.J. & H.
MAKLEY, Coral, 11/6/1891-12/27/1892, Section-Lot 3-3, Dau. of J.F. & H.V. MARSTON, Robert Francis, 11/14/1810-10/13/1889, Section-Lot 3-8, b. Ercall Magna, Eng. McGONIGAL, Flora J., 3/16/1872-8/29/1872, Section-Lot 3-6, Dau of P & H.A. McGONIGAL, Nettie M., 3/5/1876-8/30/1876, Section-Lot 3-6, Dau of P & S.M. QUICK, Bernard, d. 1/1/1886, a. 0-2-12, Section-Lot 4-11, Son of H & M.I. RICHARDSON, Richard Dibble, 1914-1927, Section-Lot 2-19, d. Bath School Disaster; son of G.W. & B.A. RICHARDSON, Sarah M., d. 12/29/1868, a. 41-3-15, Section-Lot 4-2, Wife of W.J. ROBSON, Ernest N., 1870-1890, Section-Lot 4-2, d. 4/5/1890, a. 20-2-26; spm of M & J.A. ROUNDS, Almeda, d. 8/14/1870, a. 22-3-23, Section-Lot 3-8, Dau. of J.D. & S.
SAXTON, Sarah, d. 1/14/1874, a. 41-6-0, Section-Lot 4-16, Wife of J.B.
SLEIGHT, Hattie, 1845-1915, Section-Lot 4-2, Wife of Wm. E.
SMITH, Hannah, d. 3/19/1886, a. 44/8/17, Section-Lot 3-10, Wife of James M.
SOBER, Ella A., b. 12/25/1865, Section-Lot 3-3, Missing? SPANGLER, Immo, 1892-1894, Section-Lot 4-7, Son of G.E. & M.E. SPANGLER, Mary E., 1872-1898, Section-Lot 4-7, Wife of G.E. SPRAGUE, Mary, d. 1/14/1876, a. 1-4-12, Section-Lot 4-10, Dau of A & C.E. TAYLOR, Mary L., 1885-1920, Section-Lot 2-3, Wife of Archie L.
VanSCOY, Ethel, 1882-1907, Section-Lot 3-15, Wife of G.J. WATSON, Martha L., 3/16/1922-, Section-Lot 7-2, Wife of Lloyd K.
WEBSTER, , 1892-1892, Section-Lot 3-2, Infant son of A & L. M.
WHERRY, Emily, d. 3/28/1887, a. 71-0-23, Section-Lot 4-3, Wife of Wm. H.
WHERRY, Rachel, 1844-1916, Section-Lot 4-3, Wife of Wm. H.
WHITNEY, Susan A., 1865-1899, Section-Lot 3-13, Wife of G.W. WILSON, Rose, d. 7/26/1880, a. 17-6-0, Section-Lot 4-2, Dau. of J.W. & M.A. WOODMAN, Harold LeMoyne, 7/3/1918-5/18/1927, Section-Lot 2-16, d. Bath School Disaster; son of H.M. & H.E.